Just about everyone has a story about some disastrous Christmas they experienced. If you ask me or my sister you’ll hear all about the year when Christmas dinner was just served on the table and my sister got a nose bleed that eventually sent her to the hospital, I got extremely ill and was sent to bed with fever and chills, the dog knocked over the Christmas tree, my father tried to vacuum up the myriad broken glass pieces from ornaments we would never see again, and the water from the tree stand made the vacuum cleaner short out and catch fire. All of this happened in about a half an hour. We didn’t blame our Christmas horror on the food like Ebenezer here. No one ate Christmas dinner that year. Ours was not an earth-shattering disaster but it has always made a good story especially when my sister tells it. She got to watch the Hoover catch fire and our father rush out the front door with it and toss it into the snow. It seems to me the Thanksgiving dinner tradition is quite different from the Christmas one. Thanksgiving is usually one main, all-important, all-American meal and the people who are eating it are zeroed in on that main course and all the trimmings and side dishes they have loved year after year. There’s a little less decision-making as to what to cook but a lot more investment in the final outcome of that sacred stuffed turkey and cranberry sauce with all their fixin’s and sides. There is so much for a cook to choose from at Christmastime! Everything from cookies, party foods, eggnog, gingerbread people in their gingerbread houses. . . not to mention that the Christmas cooking season stretches on for weeks and weeks giving us plenty of time to try all the dishes our hearts desire while still turning a blind eye to anything so mundane as caloric content because it is, after all, Christmas! There’s traditional Christmas food from every part of the world as well as our own homegrown family traditions. I guess some people get around all those choices by simply making another Turkey Dinner for Christmas. My mother did that. Our Christmas dinner was always exactly like our Thanksgiving one except at Christmas there were Christmas cookies. (Including my grandmother’s wine cookies which I wrote about last year but I promise this year not to whine about wine cookies again. My own Christmas cooking has run the gamut starting with Turkey Dinner Like Mom Used to Make until one year when I saw a recipe for slow-cooked turkey that promised a very amazingly moist roasted bird. I learned there is a big difference between slow-cooked and no-cooked. We ended up ordering pizza because the turkey didn’t finish cooking until very late. Next I decided to impress a boyfriend by cooking Roast Beef with Yorkshire Pudding in honor of his British heritage. He was born in Philadelphia, PA but his adorable aunties and mother were always talking up the English in them and he did too. The Beef and Yorkshire was very experimental–no Internet in those days to look up recipes and watch videos on how it’s done–my recipe was cut out of the newspaper and it came out surprisingly well. And not surprisingly it was a very heavy meal what with the eggy Yorkshire batter being fried in the mostly fat roast beef drippings. I tried this for two Christmases just before I became a complete vegetarian. That changed everything as far as holiday cooking was concerned. Not only was I vegetarian, I had stopped eating any refined sugar and got into brown rice and seaweed! (Still into those.) But when it came to Christmas, I tried to mock up vegetarian versions of traditional food. Maybe you’ve heard of “turkey” made from tofu or Japanese seitan (sometimes called “wheat meat”) shaped like something recognizable. I often opted for stuffing a squash. 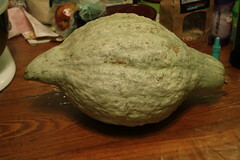 I would choose a Hubbard squash because it was fairly easy to find one that had the general shape of a turkey. (Go ahead, squint your eyes and imagine this is a turkey!) Being a big squash, the Stuffed Hubbard Turkey Squash took almost as long to bake as a real stuffed turkey. The stuffing was what you might expect–whole wheat bread dried and cubed, onions and celery sauteed in olive oil with garlic, sage, salt and pepper. Then there were all the fixings plus mock mince meat pie, pumpkin pie, cookies, potatoes, cranberry relish, etc. It would take me the best part of two days to make this dinner and my dear children would periodically come into the kitchen to hang out with me and steal stuffing. Sometimes we wouldn’t eat Christmas dinner until well after normal dinner time. My family generously refrained from complaining. This kind of grand dinner plan nearly always included way more dishes than we needed to have at one meal and, especially in my earlier years as a vegetarian, was challenging to make. And let’s not even think about the dishes, pots and pans involved! “Besides, the kettle was aggravating and obstinate. It wouldn’t allow itself to be adjusted on the top bar; it wouldn’t hear of accommodating itself kindly to the knobs of coal; it would lean forward with a drunken air and dribble, a very Idiot of a kettle, on the hearth. It was quarrelsome, and hissed and spluttered morosely at the fire. To sum up all, the lid, resisting Mrs. Peerybingle’s fingers, first of all turned topsy-turvey, and then with an ingenious pertinacity deserving of a better cause, dived sideways in – down to the very bottom of the kettle. And the hull of the Royal George has never made half the monstrous resistance to coming out of the water, which the lid of that kettle employed against Mrs. Peerybingle, before she got it up again. I am no longer a complete vegetarian, though I do eat a lot of vegetarian food. I have not yet decided what to make for Christmas dinner but I am planning to include a few choice dishes from family traditions over the next couple of weeks. At the top of that list is my vegetarian lasagna made with my family-famous squash and carrot sauce and tofu cheese. That sauce was once manufactured in a Brooklyn factory under the brand name, “Sarah’s.” They made 500 cases of my sauce before we decided to call it quits. The one that comes out of my kitchen is a thousand times better. Another will be a Hungarian chestnut pudding called “Gesztenyepure.” I learned about it from my daughter-in-law who is from Budapest. And if it comes out well, I’m thinking about how I could make it and send it to her. And if it comes out well, I’m thinking about how I could photograph it and give the recipe to you, my dear blogging friends and followers. I’ll probably end up telling you about my Instant-But-Not-Out-of-a-Package Stuffing, too. I miraculously discovered how to make a bread stuffing in ten minutes that comes out very well and can be made for only one or two people or servings at a time. My husband liked it so much, he thinks I should blog about this. I often indulge in an oyster stew for Christmas dinner. It’s on my list of maybes, depending on where the oysters are from. 1. Soak wheat berries in one cup of water overnight. Drain wheat berries and place in a small saucepan with 1 1/2 cups spring water and a pinch of sea salt. Bring to a boil and then reduce the heat. Cover and cook 30 minutes until the liquid is absorbed and berries are tender. Spread the cooked berries out on a towel to dry. 2. Heat 2 teaspoons of olive oil in a skillet over medium heat. Add wheat berries and saute until lightly toasted (about 10 minutes). Stir in soy sauce, cayenne and lemon juice. Keep the wheat berries warm until you are ready to serve. 4. Assemble the salad, toss the field greens and pears with the dressing in a salad bowl. Top with warm wheat berries and if desired, garnish with currants. This entry was posted in Cooking, Food, Recipes and tagged Charles Dickens, Christmas dinner, family tradition, holiday cooking, Hubbard Squash, Stuffing, vegetarian, Yorkshire Pudding by mycookinglifebypatty. Bookmark the permalink.